During the last few months MACC-III organized two User Workshops to interact with its users. On 3 and 4 March a Policy user Workshop was held in Vienna aimed in particular at national experts, who support national policy makers reporting air quality under European legislation. On 11 May MACC-III organized, in collaboration with the Italian user community, its third User Workshop. This meeting took place in Rome and attracted more than 70 participants from across Europe. Both workshops succeeded in engaging with more users and acquiring important feedback on the services. Presentations from the Policy User Workshop and the general User Workshop can be found on the MACC-III web site. 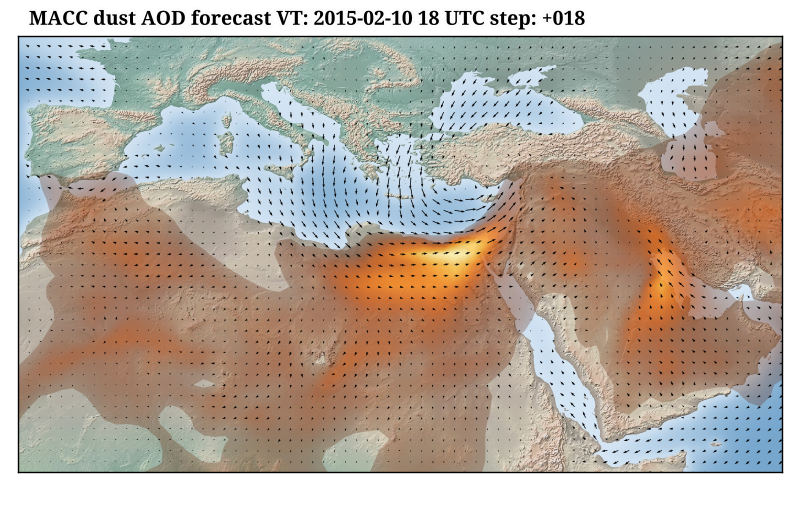 A massive desert dust storm swept through the Middle-East early February affecting air quality, visibility and air traffic. The MACC-III forecasts were very successful in capturing this event, forecasting high concentrations of desert dust 4 days in advance. The full news story can be read on the MACC-III web site. The transition from the series of MACC projects to the fully operational Copernicus Atmosphere Monitoring Service (CAMS) is progressing well. While many visible and non-visible changes will happen over the coming months, everything will be done to make the user experience as seamless as possible. By the end of the year CAMS will provide improved services to its users in terms of quality, reliability and support. During the transition user feedback will remain very welcome and can be expressed through the web site or by writing to info@copernicus-atmosphere.eu. 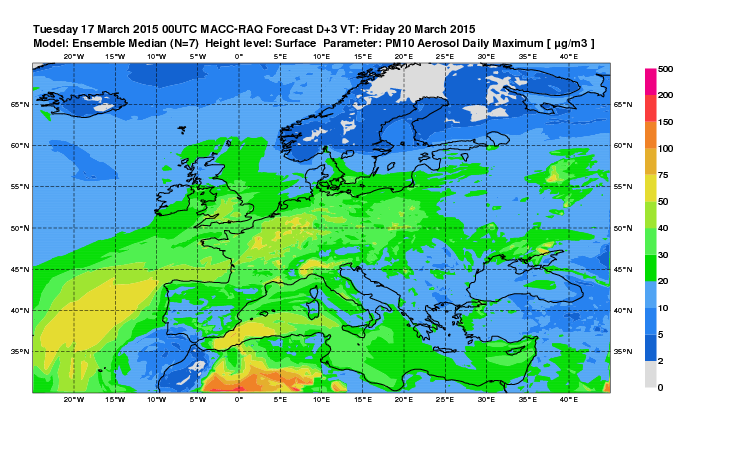 In the week of 16 March poor air quality affected Western Europe, especially over France. MACC-III provides support to national authorities either through the provision of boundary conditions from the global forecast system or through the direct use of its regional model ensemble. More on this story can be found on the MACC-III web site. The data servers for global near-real-time and reanalysis data have recently been complemented by a data server for the daily fire emissions from the MACC Global Fire Assimilation System (GFAS). A new interim global reanalysis (2003 - 2014) will soon be available. This reanalysis was produced on request by several users and will fill the gap between the MACC reanalysis and the reanalysis that will be produced as part of the Copernicus Atmosphere Monitoring Service. More information will be available soon on the MACC-III web site. The Copernicus Masters competition is inviting all interested participants to submit outstanding ideas, applications, and business concepts involving innovative uses of Earth observation data by 13 July 2015. Data from the MACC services, such as on air quality, greenhouse gases, fires and desert dust, can also be used to compete in this exciting challenge. ECMWF operates the Copernicus Atmosphere Monitoring Service (CAMS) and the Copernicus Climate Change Service (C3S) on behalf of the European Commission until the end of 2020. ECMWF has started the procurement process to identify and work with a range of organisations from the public and private sectors that will contribute or deliver the various components or service elements of the overall service. More information can be found on the ECMWF web site. Copyright © 2015 ECMWF, All rights reserved.